Designing apps and services for parental consent is challenging. How do we take the challenge and opportunity to build trust between parent and child both online and offline. Garms is a fictional online fashion retailer primarily aimed at young people. They sell items from over 500 brands and also host a marketplace for peer-to-peer re-sale. It records items you add to your cart, including items which you don't purchase. Garms does this to save items for you to purchase later, alert you to items running low in stock, and improve your product recommendations. A copy of your passport or driving license, for identity verification purposes, to allow you to sell products in the Garms marketplace. Your email address, so Garms can occasionally email you with special offers and product recommendations tailored to your tastes. Teens are a sophisticated group of digital users who live their lives online. They are generally extremely aware of online safety because it's taught as part of the curriculum in schools, but they may need reminders of data transparency and trust when they're online. A particularly tricky challenge when designing for young people is the issue of giving consent. In what circumstances can a minor give consent? When and how do you involve an adult in the process? What kind of interactions might arise between adult and teen as a result? These are especially relevant factors that need to be considered when designing an online marketplace where money is involved. 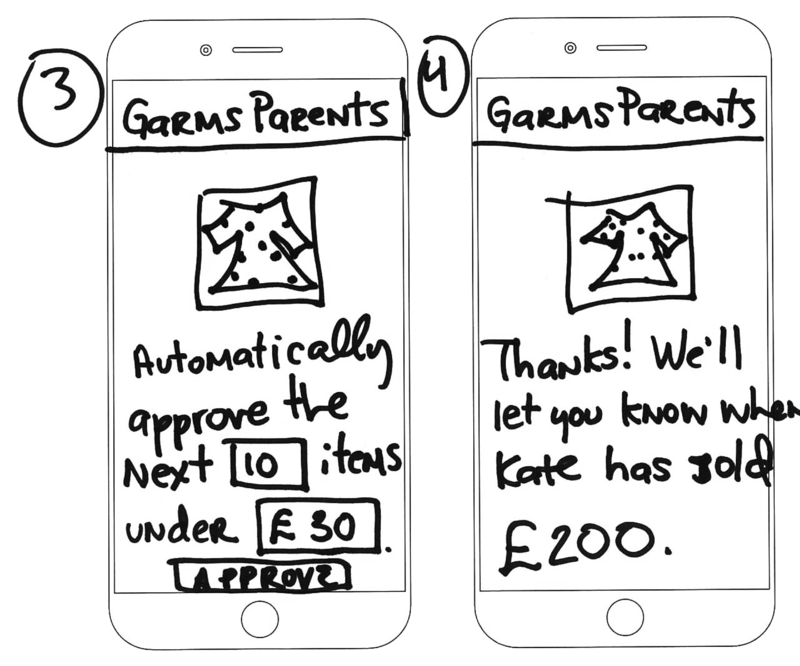 Garms' peer-to-peer marketplace was designed to enable trust between the teen and the parent. It strikes a balance between creating a fun experience for the teen while giving the parent confidence that their child is safe on the platform. The most crucial interaction revolves around the parent giving consent for a sale or purchase, designed to be as non-invasive as possible. Using the fingerprint functionality that already exists on most phones, it facilitates a real-world conversation between the parent and child and encourages transparency in their relationship. This is particularly crucial as the transaction involves money. Once approved, Garms reminds the teen about their personal data, who has access, and also gives an additional safety tip. Garms holds personal data such as bank details, purchase and address history. Additionally, it holds identity information in the form of a passport, which is used only once for verification when a person wishes to begin selling on the platform. 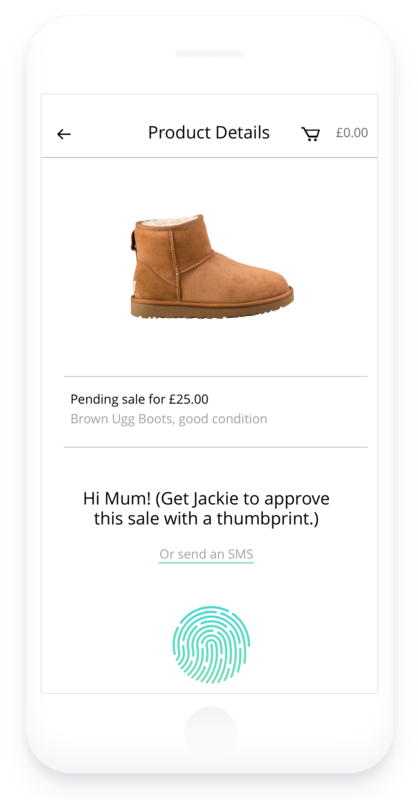 Garms makes it easy to remove the identity information, and the person is prompted with a friendly reminder that they will need to upload their ID again the next time they wish to sell on the marketplace. When deleting the data, it is visually represented as passing through a real-world shredder. This visual metaphor gives abstract data a concrete and tangible quality which is easy for people to understand. By making the deletion of identity data as easy as the upload, it creates greater trust by giving people full control of all the data a service holds, not just the data generated by using the service. The design explorations all revolve around maximising trust in Garms and the personal data that it has to hold to be able to run a peer-to-peer marketplace. Allowing users to tangibly see and explore their own data and have control over it was a good way of enabling a transparent and trustworthy experience. The designs were also exploring the issue of parental consent. Thomas Jarret, designer at Normally, and Garms' designer for a day insisted that 'taking these personal and divergent interactions offline and encouraging real life conversations, as opposed to digital notifications, felt like a more engaging way to solve this problem. This is something that could be explored further, and is an interesting way of utilising the biometric data that smartphones can capture'. Explore more complex interactions that take place on a peer-to-peer marketplace? A team member imagined we could do this with chatbots! Find other methods to allow remote parental consent: what about setting up the conditions for automatic approval, as one of Team Garms' members suggested? Explore how identity/verification data could be treated differently from the data generated and stored while using the app or service? Develop ideas around exchanging financial data which give people a feeling of security and transparency?